Grammy Award-winning, American rock guitarist SLASH and his band Myles Kennedy & The Conspirators are thrilled to announce New Zealand rock royalty Devilskin as the support act for their January 2019 tour, playing Spark Arena, Auckland in New Zealand. “Watch out for them conquering a continent near you soon!” - KERRANG! Bassist and founding member of Devilskin Paul Martin says, “We are absolutely delighted that Slash has invited us to be special guests on the Australasian tour. We had so much fun on tour through Europe and we are really excited to be bringing our high powered show to our ardent Aussie and Kiwi friends. 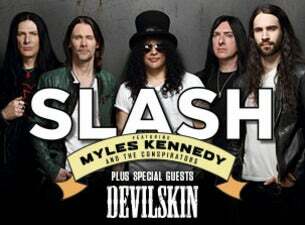 It's going to be a great few weeks and we are all totally looking forward to catching up with Slash and crew again." Known for their blistering and intense live shows, watch Devilskin perform their stunning, explosive sets with Slash Feat. Myles Kennedy & The Conspirators in January 2019. New Zealand’s obsession with Slash, in any guise, is steadfast - we can't get enough of him. A new story started with his first solo album Slash (2010), which debuted at #1 on the Official NZ Album chart and is certified Platinum. As Slash Ft. Myles Kennedy & The Conspirators, he released the critically acclaimed Apocalyptic Love (2012), followed by World On Fire (2014) and now the latest album Living The Dream. Slash has amassed album sales of over 100 million copies and was inducted into the Rock n Roll Hall of Fame in 2012 . "Making records and touring and getting up on stage every day and playing music with these guys, that is the essence of living the dream” says Slash. The NZ connection is strong – this will be the bands third tour of the country’s largest arena! Make sure you become part of the latest chapter in this band's story when Slash Ft Myles Kennedy & The Conspirators grace a stage near you.